The Oral Health Foundation launched this year’s Mouth Cancer Action Month at the House of Commons. More than 75 people from across 40 organisations were in attendance and heard from a range of speakers reemphasising the need for greater nationwide support for mouth cancer awareness. Dr Ben Atkins, trustee of the Oral Health Foundation introduced Sir Paul Beresford MP, the event’s parliamentary sponsor. Sir Paul spoke about the importance of campaigns such as Mouth Cancer Action Month, before highlighting the landmark decision made by English, Welsh and Scottish governments to introduce gender-neutral HPV vaccinations. 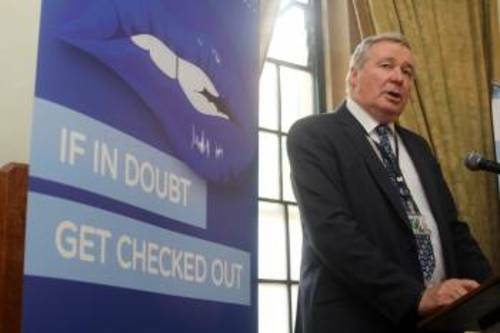 The Oral Health Foundation’s Chief Executive Dr Nigel Carter OBE, spoke about the continued importance of mouth cancer awareness. He said: “It is a great pleasure to be able to bring so many ardent campaigners against mouth cancer in one place, to help drive home the importance of the continued need for action. Paul Roebuck, who was diagnosed with mouth cancer last year, addressed the room with his powerful, emotional and important story of his fight with mouth cancer. He said: “When you get diagnosed with mouth cancer you ask yourself a series of questions; what about my mortgage, my bills, my car, my kids education, my legacy, my life’s work? What will happen to my kids, my wife, my family and friends will those people stand by me? To find out more about how you can support the Mouth Cancer Action Month, visit www.mouthcancer.org.